Plot. Income: 4. Initiative: 5. Claim: 1. Reserve: 6. Plot deck limit: 1. When Revealed: Choose an opponent. That player chooses 2 non-Army characters, each with printed cost 6 or higher. Then, that player chooses and kneels 1 of those characters. Kill the other (cannot be saved). 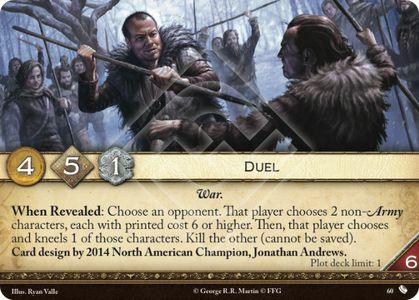 Card design by 2014 North American Champion, Jonathan Andrews. The Fall of Astapor #60. If there are not enough valid targets at the time the opponent is choosing characters, the effect fails to resolve. A character that cannot be knelt (e.g. already kneeling) and cannot be killed (protected by The Eyrie) is not an eligible target for this effect (see Target). After the two initial target characters are chosen, you must "choose and kneel" one that can be knelt (you cannot choose a kneeling character, or Ygritte). Whether the other can be killed or not is irrelevant at this point. If you cannot "choose and kneel" one character, then there is no "other" character to kill, so the remainder of the effect will do nothing.